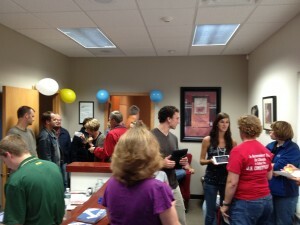 WI Report: Liberty Headquarters Grand Opening! Wisconsin officially opened our 3rd Liberty Headquarters last night with our Grand Opening of the Sheboygan County office. We had a great turnout of patriots with more than 50 people stopping by the office to learn about American Majority Action and our plans for this upcoming election season. With 6 weeks until the election, folks were excited to be volunteer and do their part to make a difference. Many of the attendees came along with us as we canvassed in Sheboygan County neighborhoods. We also demonstrated how Gravity makes our voter contacts much more efficient than traditional walk lists or even other technologies out there. Many people were impressed with how easy it was to create walk lists, optimize them, and then assign the walk lists to volunteers already out in the field. We are following up the Grand Opening with a phone bank tonight from 4:00pm-7:00pm and a Door Knocking Blitz on Saturday from 10:00am-4:00pm. Our new office is located at 220 S. Business Park Drive, Oostburg, WI 53070. Stop on by if you are in the area or visit one of our other office locations in Brown County and Ozaukee County! Be on the lookout for more information about a 4th Liberty Headquarters in Waukesha County as well.